He's the father of ska, and was recognized as such long before he actually became aware of it. 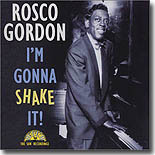 He called it, "Rosco's Rhythm," and it got him some gigs, but never made him rich. He recorded on Sun Records, and coincidentally sounds somewhat like an African-American Jerry Lee Lewis. There's not a bad song among the 22 included on this 1951-1957 collection. Gordon's one of those pianists made for Rock/R & B dance music, with a left hand strong enough to get people on their feet. His playing can be heard over drums and saxophone, and recording wasn't good enough to make that happen on record at that time and place if it hadn't really been happening in the studio. There's a quick quiver in his voice, combining the edge of a human scream with the edge of overloading those old tube studio processors. This was a sound that made Rock inevitable, not only because it sounded so good, but because his work was undoubtedly familiar to labelmates Elvis Presley, Jerry Lee Lewis, Roy Orbison, Billy Lee Riley and other, better known shapers of the form. Gordon also shared silliness and willingness to make a clown of himself for the sake of performance with peer piano players Little Richard, Jerry Lee Lewis and Fats Domino. There are jumping nonsense songs here, and there are sad ballads punctuated with melodramatic tears and sniffles. Sun Records magnate Sam Phillips, after losing Elvis Presley, became fixated on making a big star and big cash, and there came a day when he began devoting almost all marketing efforts and budgets to Jerry Lee Lewis. That was good for Jerry Lee, but not good enough to overcome public repugnance when he married a 13-year-old cousin, and it left a lot of other great Memphis talent, black and white, out of the national spotlight. Rosco Gordon is part of that group. It is my sincere hope that this mention will help turn some of that spotlight back on him, where it belongs.